You’re a committed couple who dreams big. You want a thriving life. Your relationship, family life, professional pursuits, and maybe even a growing business are all of piece. You want all aspects comfortably melded, yet sometimes it’s important to disentangle them to make sure each facet is thriving on its own. How do you establish a successful career while supporting your partner’s goals at the same time? You wonder how to smoothly transition back and forth with your family needs, yet meet your own needs? How do you keep the lines of communication open if your mate is moving faster or slower than the two of you had planned, and it impacts your career? How do you “take turns” yet keep from burn-out or resentment? Do you feel confident that if you slow down the work trajectory to raise family, support your mate, deal with a disabled family member or aging parent you will be able to step in again at a later time, and have the support of your mate? Do you have long-term plans together with strategies for meeting both your individual and mutual goals? You’ve got a good relationship but want more for your future. 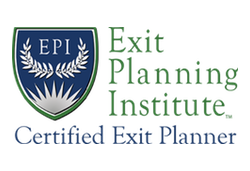 You need help visualizing and strategizing a plan that meets everyone’s needs. Are you experiencing financial disparity and don’t know how to talk about it? One wants to change jobs or career paths, what do you need to know to confidently make choices, and mutually support that change? The business is taking the focus. You are left to run the home, raise kids, feeling out of touch with your mate and worried you’ll be so disconnected your marriage will not weather the long haul. You’re not sure your mate even is aware of how far apart you’ve grown. How do you constructively raise the issue and repair the disconnect? One of you has been offered a promotion requiring a major relocation. How do you face this choice point together and strategically act to ensure you have a great time, stay connected while meeting all family member’s needs? 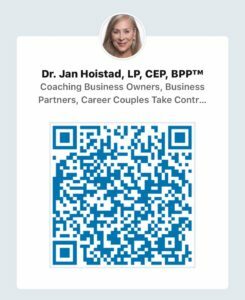 The Big Picture Partnering approach, developed by Dr. Jan Hoistad, is especially helpful for professional couples with two careers, entrepreneurial couples with one or two businesses or the couple with one overseeing the household and family organization while the other works in the business. When you smooth out your daily details and reach for your greatest visions together, your life at home and the office, together and apart, is energized, more fun and rewarding. When we clarify your long-term vision, current needs, then strategize doable steps to get you there together, it’s invaluable. The mindset, skills and tools of the Big Picture Partnering approach are all about coming together around values and vision, making decisions together—partnering towards the same end goals and life vision together. And having more fun in the process. Learn the skills together, apply them and experience the ripple effect. You’ll find application in both your business and personal life, through your team, family and beyond. You’ll be more successful in all your relationships. You’ll be able to more quickly recognize new Choice Points as they come up in life, and we’ll be able to work through them easily, moving you further faster. I have been working with Jan for the past few years on a one-on-one basis to tackle some specific communication and leadership issues in my professional career. Jan has acted as my personal coach on dozens of challenges as our company has grown from 7 employees to more than 50 over the past three years. With her direction and insight, I have developed new leadership muscles that have enabled me to work more efficiently. Jan has also been an instrumental partner in my pursuit to align my professional and personal goals. The overall result is that I am a happier person and a more effective leader. On a more personal note, Jan is simply a fabulous person to work with. She is insightful, direct and compassionate. Her suggestions and insights are well-grounded and she has a great sense of humor (which is a requirement for anyone I work with). It has been a great pleasure to learn with her and I consider my consulting time with Jan to be one of the most important development tools I have in my life. I have recommended her services to many of my associates with great success and will continue to do so. Jan has been an invaluable resource to grow, define, and sharpen our (family) business. She is supportive, intuitive, clear, and creative. She has helped us vastly improve our hiring, employee management, and risk management processes, often with simple, creative strategies that make a big positive impact. She’s also helped us step back and look at the Big Picture, further defining our (business’s) mission, values, and visioning for the future, and then grounding that vision in the present. Her blending of the practical improvement of systems with the creative visioning for the future has been an inspiring part of our work with her. With Jan’s help, we’ve been able to move our business forward without sacrificing our quality of life and partnering goals. As owner of a small service company that has operated on a day-to-day basis for a number of years, there had been a lack of direction and focus – aside from the monthly budget and the immediate problems before us. Working with Jan Hoistad has helped me tremendously in three different areas: clarifying my role as leader, planning in a realistic but wide ranging fashion and creating an exciting vision of what possibilities are on the horizon for our business. She has been patient, creative and a great help in moving a ‘stuck’ enterprise forward. Jan Hoistad is a creative powerhouse. She can quickly identify key issues and guide people to find innovative solutions that move business forward. I have worked with Jan many times over the past ten years and I always leave our meetings filled with ideas I can put into action immediately. Jan’s expertise, professionalism, creativity and warmth are a powerfully effective combination. She can “size up” a situation very quickly and she knows so much about so many things that she has ideas what to do about it. I always go to Jan if I get stuck. She has had a profound impact on my personal and professional life over the past 25 years. I never hesitate to recommend her services.